Amazing Spider-Man 19 (2000) CLASSIC VENOM!!!! NM HIGH GRADE!! Spider Woman 1999/2000 Marvel Comics Lot - #1-16 - with Got Milk Trading Cards! 19-C00256: The Magdalena # 1, 2000, NM+ 9.6! See Promo! 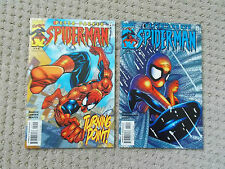 Peter Parker Spider-Man #19, Vol 2 (July 2000) - grand theft auto! Amazing Spider-Man 19 (2000) CLASSIC VENOM!!!! EXTREME HIGH GRADE! !